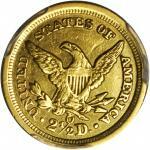 Lot:3011 1845-O Liberty Head Quarter Eagle. Winter-1, the only known dies. EF Details--Cleaned (PCGS). 1845-O Liberty Head Quarter Eagle. Winter-1, the only known dies. EF Details--Cleaned (PCGS).Rarest of the New Orleans Mint quarter eagles, Doug Winter (emGold Coins of the New Orleans Mint: 1839-1909/em, 2018 edition) accounts for only 70 to 80 survivors of the 1845-O in all grades.